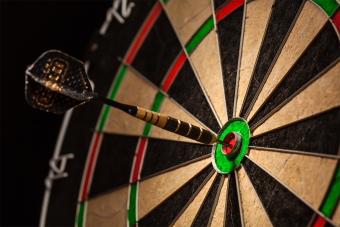 Ben W. asks: Who invented darts? While throwing rocks and dart-like objects in battle has been around seemingly as long as there have been humans, rocks, and dart-like objects, the game of darts itself is generally thought to have stemmed from the Middle Ages. Legend has it that everyone’s favorite pub game was originally invented by bored (and possibly tipsy) soldiers who had too much time on their hands in between campaigns. After polishing off a wine barrel, soldiers would supposedly take turns throwing their otherwise idle arrows at the upturned cover of the cask. It has also been suggested that this may have stemmed from a training exercise for amateur archers- having them throw the arrows first, before being allowed to shoot them. Whatever the case, the game of “butts” (referring to the cask the soldiers were chucking arrows at) caught on, and eventually people started using the cross-section of a large log as the target. It has been speculated that using such a target may be the origin of the use of a sectional dartboard; as a cut log dries, radial cracks appear, perhaps the early blueprint for the modern dartboard. Darts remained popular among the military and British army members spread the game across the globe during the height of Britain’s empire. It’s not quite clear when darts came to the U.S., although old tales about it being brought across on the Mayflower have been largely discredited. While the English version of the game likely came over at some point with British and Irish immigrants, there is also evidence that Native Americans were playing a similar game since long before first contact (again, humans throwing things at other things, sometimes for sport, is nothing new); in the United States, however, the pastime did not become a popular pub game until after World War II, when GI’s returning from being stationed in Great Britain popularized the game in this locale. Over time, darts have become standardized, with the throwing distance today set at the international standard of 7 feet 9.25 inches. Many attribute the numbers on the dartboard to Brian Gamlin, a carpenter and dartboard maker from Bury, Lancashire, England, who put them on his boards starting in 1896. Whether he really was the first, his placement of the numbers was intentional, in order to reduce the effect of lucky shots and penalize poor aim. For example, since 1 and 5 are on either side of 20, even a slightly off shot will result in a terrible score, while accuracy is rewarded 20 fold. By the end of the Roaring Twenties, the design of the dartboard had become relatively standard, with rings, wired-off segments, numbers and a bulls eye, and by the early 1930s, the old wood boards were being replaced with a compressed sisal fiber board. Interestingly, the game of darts almost died out in England in the early 1900s. Back then, the law forbid the playing of “games of chance” in licensed pubs, and darts was classified as such a “chancy” game. Offended by this characteristic (and desiring to keep a popular game in his public bar), in 1908 Foot Anakin, owner of the Leeds’ Adelphi Inn challenged the law. The matter went to court and at his trial Anakin brought a dartboard and challenged the court’s clerk to a game. Anakin went first and threw three darts for three 20s. When the clerk’s time came, he threw three darts – the first two missed and the last hit 7. Then Anakin went again and threw three darts for three double 20s. At this point the magistrate judge interrupted play and asked, “Would you care to repeat that Mr. Anakin?” In reply, Anakin threw three more double 20s. The magistrate was convinced, darts was proven to be a game not of chance but of skill, and Anakin got to keep the popular pastime in his pub. I thought it was an English invention but not the rest of the story. Thankyou.